We really do love kitchens. 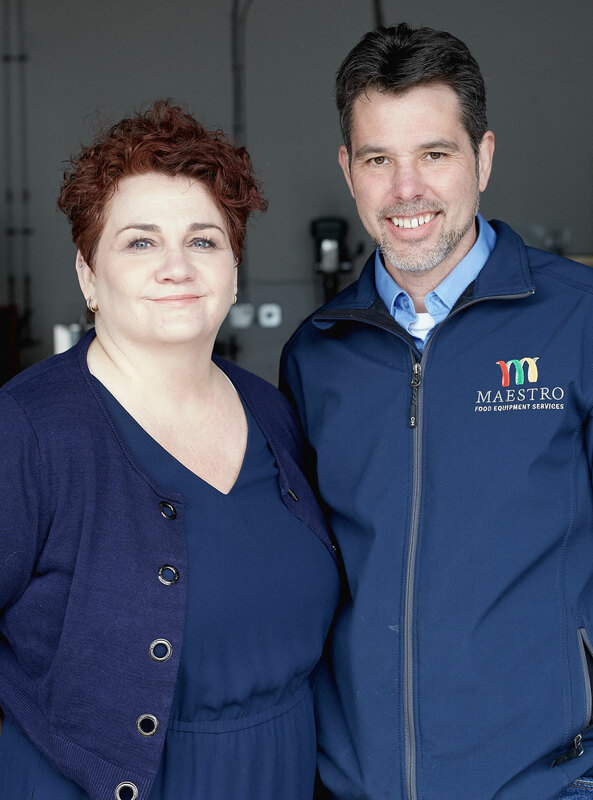 Chris and Rebecca started Maestro in 2007 with a goal of helping commercial kitchens in the Greater Vancouver Area operate more smoothly. Although we can’t keep your kitchen staff in line, we can absolutely ensure your equipment is reliable. We actually get a kick out of solving challenging equipment issues in an impressively timely manner and love when our customers share that their experience with Maestro is by far the best yet. Our commitment to you is simple: Get your kitchen up and running—fast. We do this by getting to know each kitchen and its unique needs deeply so we can plan smartly, repair intuitively, and make strategic recommendations. Our team of technicians is well qualified and, in our humble opinion, top notch at servicing everything from small appliances to large, advanced cooking equipment. They know more than just how the equipment works; they know how your entire kitchen works. When there’s new equipment launching in the industry, our team is the first in line for training. So whether your equipment is old or new, we know how to service it through and through. You can expect us to be honest, efficient, competent, and all around nice folks. Born and raised in Vancouver, Chris is a city-lover with a country heart who loves motorcycle riding, fishing and camping. Ask him what he loves most about Maestro and he’ll say: “Getting customers up and running!” He loves fixing problems and eradicating frustrations. Taking care of customers and their livelihood is priority number one for Chris. So much so that every Maestro team member is required to amaze at customers service. Without exception. Rebecca is a multi-tasker extraordinaire! She’s a proud mum of two teenagers and the woman who runs the operations at Maestro—from administration to bookkeeping to customer service and more! Most of her work is behind-the-scenes; and all of it is essential to a great service experience. In her spare time (it’s rare! ), Rebecca is a social butterfly, splitting her time between friends and family. Colin is a British immigrant who loves to tinker. He’s been an equipment technician for more than 10 years in Canada and loves that every day in the field at Maestro is different—new equipment, new locations, new people. When he’s not servicing kitchen equipment, he gets his hands dirty maintaining motorcycles and ATVs. Tiffany is a Star Wars enthusiast, a panda fanatic (she just really loves those bears), and a people-person. She moved to BC from the Northwest Territories with her husband and dog in 2014. Since then, she joined Maestro and had a baby, too. She’s the voice on the other end of the phone who makes prompt service happen. Adam knows equipment through and through. He’s our in-house parts specialist who emigrated from the US in 2009—seduced by BC’s incredible landscape. He’s a jack of all trades, really. One of those men who’s just good at everything—from framing houses and silver-smithing to musical endeavours. Leon has been servicing equipment and complex mechanical systems for more than a decade, so he knows his stuff. And, more importantly, he knows your kitchen equipment. When he’s not fixing things, he loves to explore nature and discover new places with his family. Known in-house as the “Italian Stallion,” Tony can usually be found working on and around his home, riding his motorcycle, or putzing around the yard with his wife. He’s a 20-year service industry vet—10 of those years with Maestro. So he’s a fixture in the field and well loved by customers and staff alike. Pavel was born in Moldova and is married with two kids. Family is priority number one for Pavel. Well, that and sports. He loves to play sports, watch sports, and talk about sports. The service industry fits Pavel perfectly—because he loves meeting new people, fixing equipment, and solving problems. Happy customers make Pavel happy.